Doctor's Best Glucosamine Chondroitin MSM + Hyaluronic Acid provides four important nutrients which help maintain healthy joints and connective tissues: glucosamine, chondroitin, Methylsulfonylmethane (MSM, from OptiMSM), and Hyaluronic Acid (BioCell Collagen). 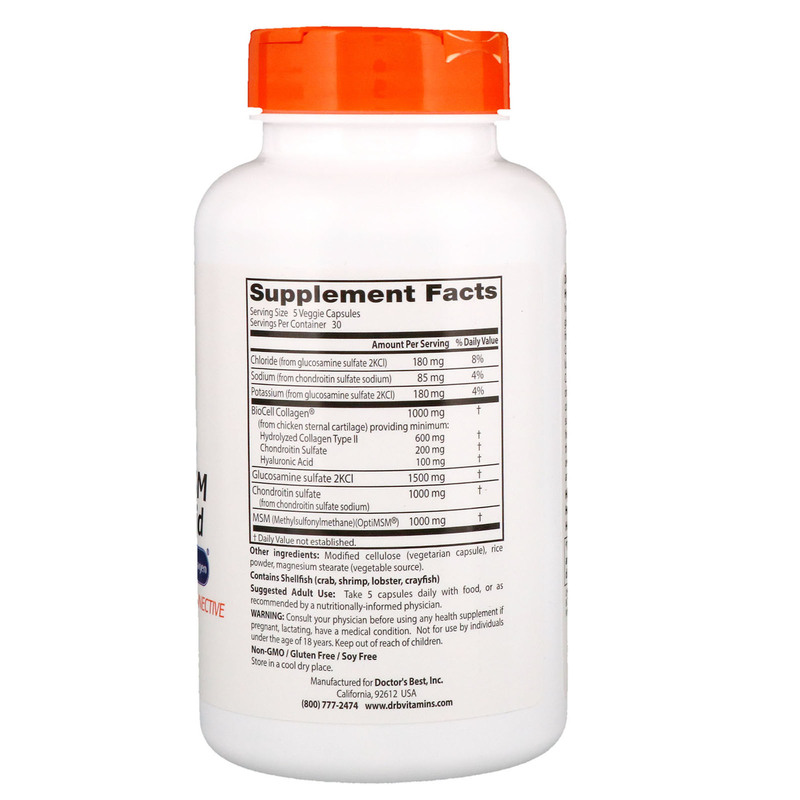 Glucosamine sulfate helps promote joint lubrication for better joint movement and flexibility. Cartilage, composed of proteoglycans, is mainly located on bones and near joints and consists primarily of collagen protein with side chains called chondroitin sulfate. MSM supplies bioavailable sulfur needed for joint health. BioCell Collagen is a proven dietary ingredient that contains a patented composition of naturally occurring hydrolyzed collagen type II, chondroitin sulfate, and hyaluronic acid in a highly absorbable matrix. 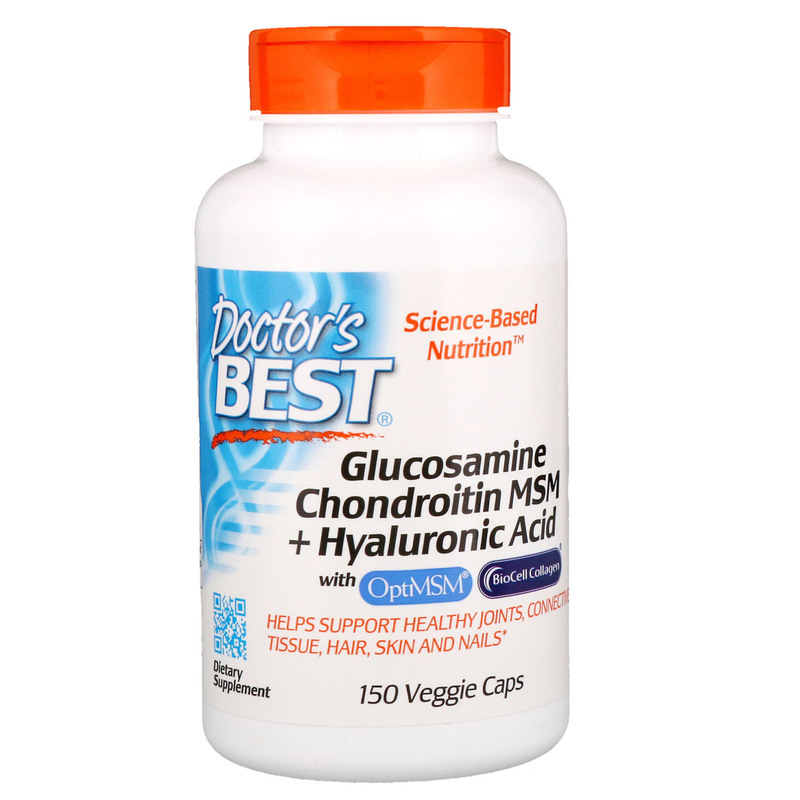 Helps support strong, healthy and flexible joints. Helps support the body's connective tissue. Helps support healthy hair, skin and nails. Adult Use: Take 5 capsules daily with food, or as recommended by a nutritionally-informed physician. Consult your physician before using any health supplement if pregnant, lactating, have a medical condition. Not for use by individuals under the age of 18 years. Keep out of reach of children.